Louis Moinet has made a singular watch, as a tribute to a man whose vision spanned decades. The man was Sheikh Zayed bin Sultan Al Nahyan, and he was the founder and leader of the United Arab Emir of Abu Dhabi, from the day of its creation in December of 1971. Sheikh Zayed made his country into a leading regional power, and developed the national resources. Moreover, he used those capacities to develop his nation itself, building schools and hospitals, and making the land into the tourism powerhouse it remains today. He made glass and steel spring from the desert. To pay tribute to such a man, Louis Moinet created a truly enrapturing watch. 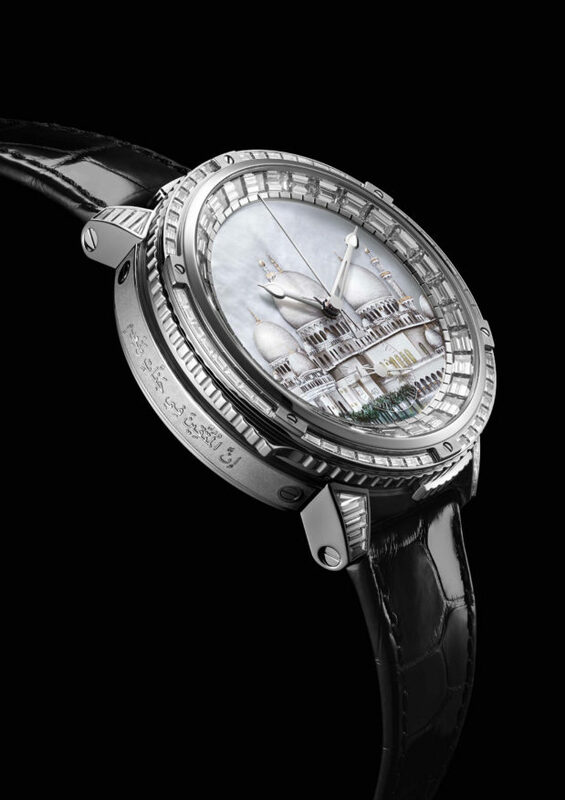 The Sheikh Zayed Grand Mosque timepiece is a watch that took three years to develop. They began with a hundred-year-old watch caliber, selecting one that had been first manufactured at the time of Sheikh Zayed’s birth. From that watch movement, they created a timepiece that uses a minute repeater and a chronograph. 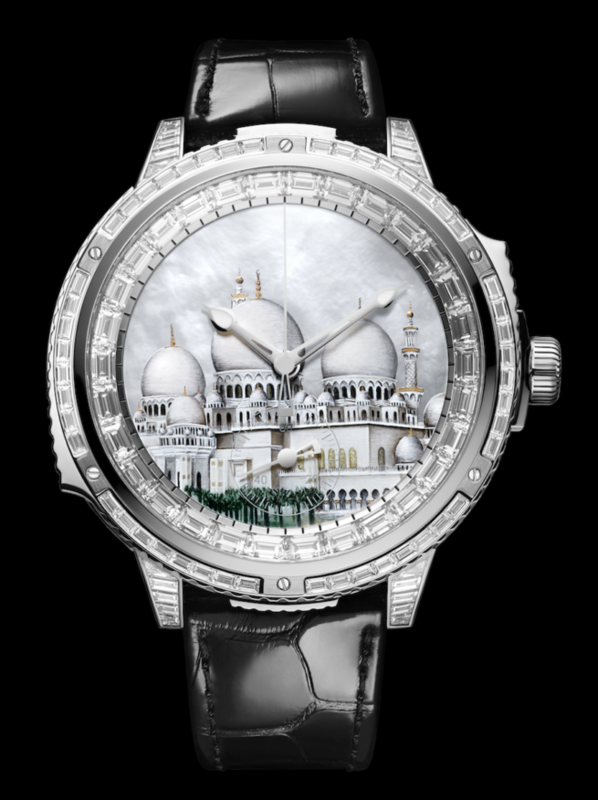 Those choices were deliberate: the minute repeater chimes out in memory of the glorious days of the United Arab Emirates under the hand of the Sheikh; the chronograph marks out the passage of that time when the Sheikh was racing to build his nation as fast as possible, to take his people into the modern times that he knew were to be the future. Such a piece requires special attention, and indeed, special construction. The minute repeater and the chronograph function required more than a hundred different components, each of them specialized, and most of them fully hand-finished. But the watch, and particularly the dial, is a work of art. It’s a representation of the largest Mosque in the United Arab Emirates, the legendary Sheikh Zayed Grand Mosque itself. 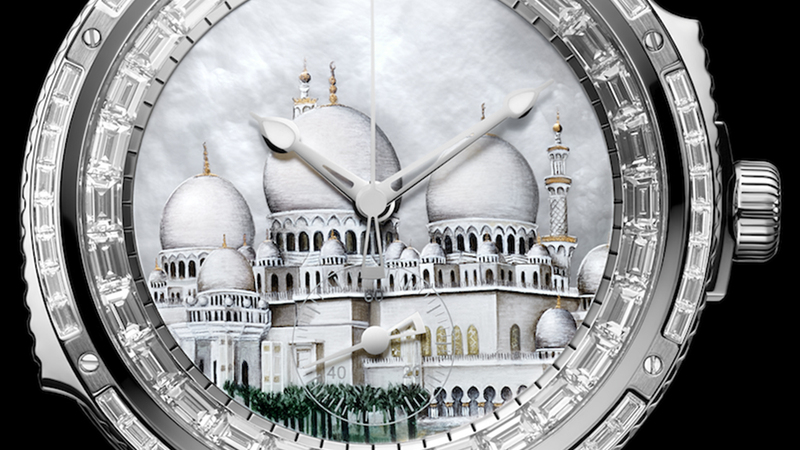 The watch carries the view of the Mosque, on a mother-of-pearl dial that adds a haunting translucency. The micro-painting is so sharp that you can see the shadows within the building, and the trees on the grounds. The painting stands out still more due to a special technique that adds a slight element of relief; the Mosque actually seems to come out of the dial itself. The dial is further surrounded by thirty baguette-cut diamonds. And the case itself, solid and engraved, has a further 68 baguette-cut diamonds. As a singular tribute, the watch is, and will remain, unique in the world Like Sheikh Zayed himself, there will never be another.